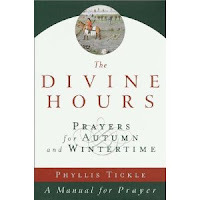 One of my classes this semester is Worship Arts & Discipline and one of the books we have to read this semester is titled, The Divine Hours - Prayers for Autumn and Wintertime by Phyllis Tickle. I am not one to follow a liturgical set of prayers on a daily basis, but I am enjoying drawing closer to God through the practice of the daily office prayers, in the morning (Morning Office), midday (Midday Office) and evening (Vespers Office). I don't know how much I'll continue with the practice of the Daily Offices after the semester, but I have been enjoying this brief time of reading and prayer. Even though this post is the day after what I read, last night's reading included a hymn, Breathe on Me, Breath of God and was written by Edwin Hatch (1835-1889), which I found to be a great blessing and the first time I've ever read of this hymn by Edwin Hatch too. The title of this hymn reminded me of a song by a similar title that is sung by Hillsong, Breathe on Me. The hymn below reveals Hatch's theology of God and I hope you enjoy reading today this short but beautiful hymn as much as I have and that you may share it with others. If you have a favorite hymn that you love to sing, what is it, who wrote it and why do you like/love it so much? Though this may look anonymous, this is Amy Davis. I just didn't have any of those other IDs. Peter, I have a book that I found at a bookstore, Selected Writings and Hymns of John and Charles Wesley that I look forward to reading.